The magnificent city of Mumbai has always been an attraction for our guests. Beyond enjoying what the city has to offer, our guests look forward to visiting our project sites and meeting our beneficiaries. When guests visit our preschools, the smiles, innocence and warmth of our children instantly create a heart-warming experience for our guests. Christina, our guest from Spain visited our preschools in Govandi and Powai on 15th October 2018. She enjoyed playing games and practicing yoga and meditation with the children. Our guest enjoyed her day, laughing and participating in the class activities. Christina also visited our Life Skills Empowerment Project in St. Rocks High School to meet our adolescent beneficiaries. The excited girls interacted and shared their experiences with her. Extremely happy after spending the day with children, Christina was inspired to lend a helping hand. 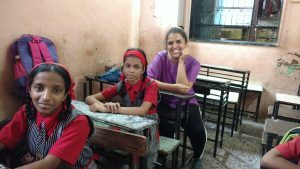 She congratulated Mumbai Smiles on the good work the organization has been doing for equality among the underprivileged. We are grateful for Christina’s support!